Maine Wabanaki-State Child Welfare Truth & Reconciliation Commission member Carol Wishcamper speaks to participants at a commission dinner in Hermon on Sunday. HERMON, Maine — A commission formed to help heal the divide between the state and its native people called Sunday for Maine leaders to respect the sovereignty of Maine’s four Indian tribes. Maine Wabanaki-State Child Welfare Truth & Reconciliation Commission members celebrated the culmination of a two-year effort to expose what happened to tribal children who were placed in the state child welfare system. 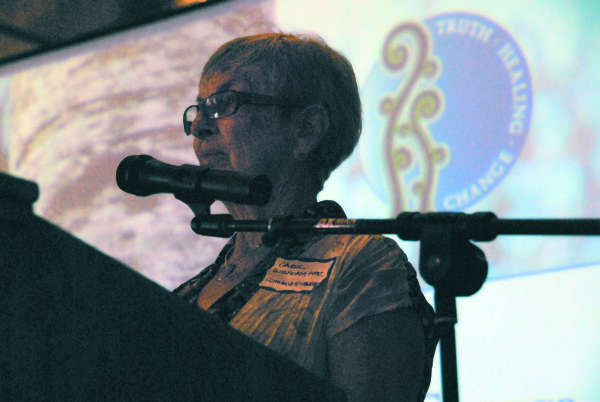 The Morgan Hill Events Center dinner drew close to 300 social workers, tribal members and researchers. Some of the five-member commission’s findings are disturbing. Within the last 13 years, native children were 5.1 times more likely to end up in foster care than non-natives. Up to 53 percent of the state foster care service intake cases in 2006 and 2009 failed to identify whether children were Native Americans, effectively denying the Native Americans governmental aid. “We interpret this information within a web of interconnected causes, including institutional racism in state systems and the public; the effects of historical trauma; and a long history of contested sovereignties and jurisdictions between the state and the tribes,” wrote the authors of a 16-point summary of the commission’s findings. The commission’s review does not examine present conditions in the state’s child welfare systems, officials said. Maine has about 8,000 Native Americans in its population of 1.3 million. The practice of taking Native American children from their homes and placing them in boarding schools or foster care became systemic in the late 1800s with the formation of the Carlisle Indian Industrial School, which sought to stamp out the languages and cultural practices of native people, according to documents from Dickinson University’s Carlisle Indian Industrial School Digital Resources Center. At least 52 children from Maine were enrolled at the school over the course of several decades, according to Maine-Wabanaki Reconciliation, Engagement, Advocacy, Change and Healing documents. The total number of children taken from their homes is unknown, according to staff. Commissioners gathered more than 160 statements from 13 focus groups in Maine and commonly heard stories of violence and racism both overt and subtle: Native Americans being called racist names, suffering social isolation, being followed around in stores, and being made to feel unwelcome in restaurants, said Carol Wishcamper, one of the five commissioners. Former child clients in the system regularly spoke of sexual and physical abuse. “We listened to people tell the stories several times, and as you hear it [repeatedly], you see that it has some valence,” Wishcamper said Sunday. Wishcamper praised Maine Department of Health and Human Service workers for forging an excellent cooperative relationship with the commission, but said that the problem of institutional resistance to change goes far beyond Gov. Paul LePage’s contentious relationships with Maine’s tribes. LePage and Maine’s tribes have disagreed on several issues going back to 2012, including hunting and fishing rights, land and water rights and tribe-sponsored casinos. The contentiousness culminated in late May when the Passamaquoddy and Penobscot tribe representatives withdrew from the Legislature, which they had been part of since the 1820s. The withdrawal came a month after LePage rescinded a 2011 executive order proclaiming a special relationship between the Passamaquoddy Tribe, the Penobscot Nation, the Houlton Band of Maliseets and the Aroostook Band of Micmacs and the state, and the state’s desire to include Maine’s tribes in discussions over laws and policies affecting native peoples. LePage replaced it with a new order declaring that the tribes are sovereigns in their own right and that the relationship between them and the state amounts to a “relationship between equals with its own set of responsibilities.” The order states that all tribal people, lands, resources and government structures fall under the jurisdiction of the Maine state government, which the tribes said was an affront to their sovereignty. When the legislation creating the commission was enacted, LePage stood with tribal leaders. “That’s a long way from where we are now,” Wishcamper said. Change begins with greater educational efforts and more understanding of the history of Native Americans and the impact racism has on them today, said Penthea Burns, co-director of the group that will be helping implement recommendations from the commission. A social worker who attended the dinner, Shawn Yardley, said he was pleased that the commission’s work focused on solutions. “I am really excited about what’s going to be done,” said Yardley, who works for Food AND Medicine of Brewer. Respecting Native Americans’ rights is the first step, Wishcamper said. Correction: A previous version of this story incorrectly stated that Passamaquoddy and Penobscot tribe representatives withdrew from the Legislature before the rescinding of Gov. Paul LePage’s executive order.